Movie Habit gave Episode I a favorable review, praising the movie not for its technical or artistic merits, but simply for existing, and for its cultural significance. With the voice of a different critic, we gave Episode II the same rating, but called it “much better” than Episode I, echoing the general consensus. We complete the second trilogy with our same schizophrenic recommendation, this time praising the movie for its satisfactory conclusion to a trilogy and a franchise, in spite of the usual complaints about George Lucas’s style. While not as dry or convoluted as the Star Wars parody on The Simpsons, Episode III does have an involved political plot. We open on Obi-Wan (Ewan McGregor) and Anakin (Hayden Christensen) flying off to rescue Chancellor Palpatine (Ian McDiarmid) from the droid general Grievous (voiced by Matthew Wood) in the middle of a space battle. The ailing and coughing (!) robot general gets away amid the chaos, but the Chancellor is saved, which turns out to be a mixed blessing. The Jedi Council is concerned about the Chancellor’s powers. He seems to be using war as an excuse to hold on to his already-inflated power in the Republic. Meanwhile, the devious Chancellor tries to convince Anakin to be his right-hand man. He nurtures the seed of distrust already sprouting in Anakin. The Jedi won’t let him advance, and impatient Anakin wonders whether he’ll ever get to be a Jedi. Just a little push from the Chancellor should be enough to tip this impetuous young man away from the light. The Chancellor appoints Anakin to the Jedi council, an unprecedented move that the Jedi resent. They allow Anakin on to the council, but do not grant him “master” status. Still, they hope he will keep them informed of the Chancellor’s moves. Likewise, the Chancellor has asked Anakin to spy on the Jedi Council for him. Anakin is a pawn being played by both black and white. Meanwhile, Anakin fears for his wife Padmé’s (Natalie Portman) life. He has visions of her dying during childbirth (yes, she’s pregnant). He worries so much that he contemplates seeking out the power of the Sith, at the Chancellor’s troubling invitation, a power that can bring life from death. 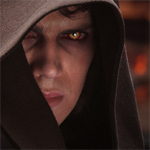 Anakin decides to tell the Jedi what he has learned — that the Chancellor is in cahoots with the Sith. It’s all the evidence the Jedi council needs to go after Palpatine. But Anakin witnesses a very un-Jedi-like arrest that threatens the life of the Chancellor, which is all Anakin needs to decide that the Jedi are a bunch of elitist hypocrites. There is a great opportunity for drama in Anakin’s downfall. Both “Mr. Cranky” and I had theories about his ultimate fall that might have played even better than the one Lucas wrote, and that wouldn’t have required the Jedi to compromise their integrity. Oh well. C’est la Guerre des Etoiles. All this plot sets up some wonderful final battle scenes. Because the Jedi have been outlawed, the new Imperial army has been ordered to kill any Jedi they find, and several old friends meet their demise. Yoda tries to kill the new emperor before his new power has a chance to take hold. And Obi-Wan tries to win back Anakin, which of course ends with a light-saber duel. Of course, “duel” is a huge understatement. Theirs is a long, drawn-out fight that takes place on collapsing scaffolding in front of exploding fountains of lava, on precarious pieces of flotsam in a river of lava that carries them inexorably to a giant magma Niagara. “George sure lays it on thick,” said a friend of the final climax. Star Wars: Episode III — Revenge of the Sith is not great film. The quiet scenes between Anakin and Padmé don’t play very well. Hayden Christensen is often as engaging as a flat, wooden plank. And every frame is supersaturated with robots, ships and other visual noise. All of these criticisms, so frequently repeated that they are practically clichés, are valid. Nevertheless, the movie does some things well. First, the adventure scenes are all top notch. There are battles, duels, and dogfights galore. Maybe Lucas lays it on thick, but it’s sure fun to watch. But what is most important is that the movie wraps things up nicely. We already know what happens both before and after, and there is great satisfaction in seeing the gaps filled. Lucas almost goes too far in filling in the gaps. We know that Padmé must have twins, and we know who they must be, so there is really no need to spell it out. In fact, the audience might come away feeling a little smarter if we were allowed to make a few more mental connections ourselves. Lucas also introduces us to the Wookiee planet, and we just happen to meet one named Chewbacca, which I found too coincidental, too distracting, and unnecessary. Still, one leaves the theater with a 30-year sense of closure and satisfaction. That’s a pretty good feeling, one you don’t often get at the movies.